In creative writing, we always hear showing versus telling. What does that mean? It means you create a scene in a story, showing all details rather than explaining it. Or do not make it expositional, or describe, only show. For, e.g. 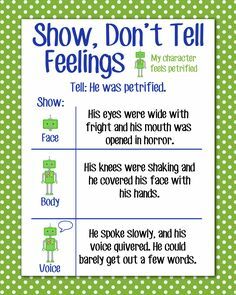 instead of telling your character was angry, show how his eyes went red-shot, his mouth quirked in disgust, he stamped on the floor etc.